The Truck N’ Buddy is the best thing that could happen to a truck owner. The Truck N’ Buddy opens up a whole new world of possibilities for pickup truck owners. Use the Truck N’ Buddy as a step up for both owners and pets, as a seat for hunters and golfers, or as a seat for NASCAR fans and tailgaters at football games. The Truck N’ Buddy attaches to the tailgate of standard pickup trucks, to the floor of equipment trailers and flatbed trucks.The Truck N’ Buddy has a maximum weight capacity of 300 lbs. and weighs only 16 lbs. It is constructed of aircraft aluminum and stores compactly out of the way on the tailgate itself. 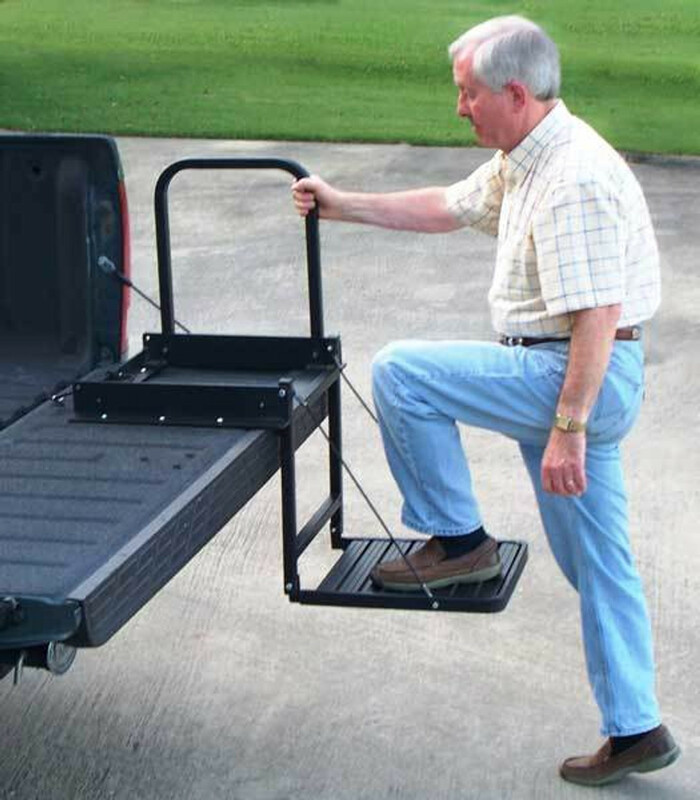 The Truck N’ Buddy’s step / seat platform is supported by 1700 lb. test cables and has built in traction ridges for sure footing. It also features a handy 18” grab rail to insure safe entry onto the truck or trailer.